It is most extraordinary that the ancient people, who by their language, their laws, their literature, their arts and sciences, and their great deeds, influenced their own and all subsequent ages more than any other one nation that ever existed, the world-famed Phoenicians, should be at the same time so well and so little known to us, and that their history and their institutions, of which we read on almost every page of ancient story, yet are a blank to us. The Phoenicians were the great merchants of antiquity, in fact the greatest mercantile people of all time; the most enterprising race of explorers and navigators the world has ever known, not excepting even our own restless Anglo-Saxon race; the people from whom Greece and Rome derived the letters of their alphabet and the greater part of their civilization; and from whom through Greece and Rome, our own civilization has been derived; a people who sailed along all the shores of the Mediterranean and the Indian Ocean a thousand years and more before the Christian Era, who circumnavigated Africa ages before Vasco de Gama accomplished that great enterprise, who explored the Atlantic coasts of Europe from Cadiz to Iceland and Norway long before the foundations of ancient Rome were laid, and who, as it has with great plausibility been asserted, may have crossed the Atlantic Ocean itself more than two thousand years before Columbus achieved the daring deed, and who may have opened communication with the MoundBuilders of the Mississippi and Ohio valleys, if indeed they were not themselves the Mound-Builders, as by some writers has been asserted and argued. Not only upon the sea, but inland also, the Phoenicians established their trade. They controlled the commerce by caravan through Central Asia. In Central Europe they established communication from the Black and the Adriatic seas across the continent to the Baltic. They worked the gold mines of Ophir in Southern Africa, the silver mines of Spain, and the tin mines of Cornwall in England; and they traded with the Baltic for amber, and with the islands of the Indo-Chinese seas for the spices and perfumes and other rarities for which they were then as now renowned. And not only were they the great merchants of the world; they were likewise its most noted artisans. They furnished architects and builders to King Solomon for his great temple; and many of the gigantic structures reared by the monarchs of Asshur were the work of their hands. They discovered the mode of manufacturing glass, and likewise the famous Tyrian dye; and they seem to have had the mariner's compass to aid them in their navigation. Above all, and greatest of all their contributions to human civilization, they either invented, or introduced to the world what possibly may have been the invention of others, the original let�ters of our Graeco-Roman Alphabet, our own letters of today with but slight modification - an invention of which we daily and hourly enjoy the benefit, and without which the remainder of our civilization would be comparatively valueless. But it would require many pages to narrate the achievements of the Phoenicians, whose fame in the ancient world was in inverse proportion to the size of the country, a narrow little strip of land along the eastern shores of the Mediterranean Sea, from 100 to 150 miles in length, and from about 5 to 20 miles in width, lying between the sea and the mountains of Lebanon. And yet, strangely enough, we know exceedingly little of their history, and almost nothing of their laws and social institutions. 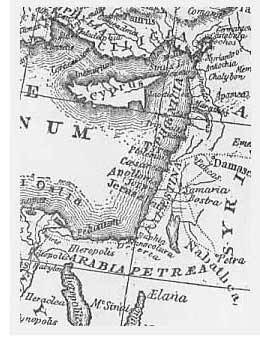 They adjoined the territory of the Israelites and probably borrowed from the latter their republican institutions, which they transmitted to their numerous colonies; for a great many colonies they planted, in which to some extent they continued their national existence, among them, Crete, Rhodes, Boeotian Thebes in Greece, Carthage and Utica in Africa, Tartessus, Cadiz, and Lisbon in Spain and Portugal, and several on the shores of the Black Sea. Tyre, and Sidon, and Aradus, the principal cities of the parent country, by their great wealth, attracted the cupidity of the monarchs of Egypt, Asshur, and Babylonia; and they suffered much in frequent wars, and were several times besieged and captured. Sidon at last was destroyed by Artagerxes Ochus, King of Persia, in B.C. 351; and nineteen years later, in B.C. 332, Tyre suffered a similar fate at the hands of the famous conquerer, Alexander of Macedon. Carthage, the greatest and most renowned of all the Phoenician colonies, was utterly destroyed by the Romans, so that not one stone was left upon another; and, except in so far as its people came into contact or collision with the Romans, or with the Greek cities of Sicily, its history has absolutely perished. We are, therefore, without any record whatever of Phoenician law, which necessarily must have been the most advanced code of law of the ancient world, inasmuch as their civil polity, their republican institutions, and the exigencies of their world-wide commerce, demanded legislation of the most liberal character; and it does not seem probable that any monumental ruins will ever be uncovered, like those of Egypt and Mesopotamia, to throw light upon the subject, unless, indeed, illumination may be derived to us from the excavation of the palace of Minos in Crete and the civilization thereby revealed, or from some yet undiscovered monument of Hittite civilization in Asia Minor. Indirectly, however, and in a general way, the excellence of the Phoenician law is testified to by the tribute paid to it by the greatest of Greek philosophers, possibly the greatest philosopher of all time. In his work on Politics and Economics, or Political Economy, as we would now call it, Aristotle, referring to Carthage, stated that its institutions were in some respects superior to those of any of the Greek States (Aristotle, De Politica, Book II, Chap. 11). And by the term "institutions" he means not merely the governmental structure and organization, but more especially the tenor of the law. And inasmuch as it is universally conceded that the "institutions" were substantially identical with those of its parent state, Tyre, what the great Greek philosopher says about the one is equally applicable to the other. Carthage was yet standing and powerful in his day; Tyre had just fallen and been destroyed. Similarly, the legislation of Minos in Crete was undoubtedly of Phoenician origin, and was famous throughout all the ages of Grecian greatness, notwithstanding that it had perished long before Athens and Sparta rose to power. There is another remarkable fact that may be mentioned. The maritime and admiralty law, as we call it, the law of all the civilized world today in respect of marine transactions, has been traced back through the Roman Civil Law to the laws of the little island and the city of Rhodes, in the Eastern Mediterranean, at the southwestern angle of Asia Minor, well known to have been a colony of Phoenicia; and while we can not trace the stream any farther than from Rhodes, it is most natural to infer that the fountain head was in Phoenicia.